In mid-April of 2012, South Korean MBC TV drama “Time Slip Dr. Jin” began the filming at a University Hospital of South Korea Gangwon-do. 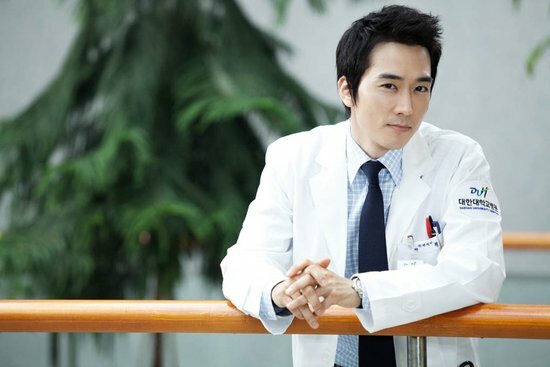 Most excellent surgeon in Korea who has success success rate of as high as 100% in surgery, Jang Hyuk, who is played by Song Seung Heon, is meeting with Yoo Mi Na who has superior medical ethnics, who is played by Park Min Young, for the first time. Song Seng Heon who was wearing a doctor’s gown perfectly reproduced the role of Jang Hyuk who is restrain and quick-witted, tempting the hearts. While Park Min Young was appearing with a fresh and long curly hair, perfectly interpreted the role of physician Yoo Mi Na who has extraordinary beauty, attracting attention. “Time Slip Dr. Jin” is adapted from Japanese seinen manga written and illustrated by Motoka Murakami, which ran for 10 years from 2000 to 2010. It tells the suffering story of best surgeon in Korea travels back in time to go to 1860’s Chosun Dynasty to practice medicine. “Time Slip Dr. Jin” succeeds MBC weekend drama Feast of the Gods, and is premiering on May 26th, 2012.